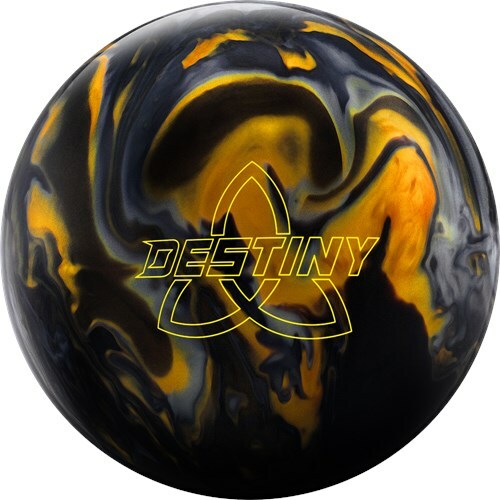 The Ebonite Destiny Hybrid bowling ball is a great compliment to its solid and pearl counterparts. This ball was designed to offer a strong midlane reaction with flip on the backend. This bowling ball offers a smashing value for your dollar! Hello and thank you for reading my review and thoughts on the Destiny Hybrid! I don't want to bog down my reviews with copying and pasting all the relevant information of how I deliver a bowling ball and all, so I'll keep this portion brief (all that info is found in my profile). I am a rev rate dominant player who sticks to 2 layouts. With the Destiny Hybrid, I went with my high flare layout of 60 by 4-3/4 by 35, placing the pin above my middle finger. I went with this layout because I wanted a little quicker response when I have some friction ahead of me. I have an Eruption Pro Blue with my lower flare layout that is softer off the spot for friction, and I wanted the Destiny to be another option late in the day. This ball is very clean down the lane, needing a great deal of friction to come into play. The motion fit exactly what I wanted. I keep this ball shiny to let it be a late in the day ball for me. For how clean it is down lane, it isn't too quick off the spot though. It's never too jumpy when I throw it right of target. Just a good all-around ball when you need something to push late in the day. The Destiny Hybrid is an amazing value for the price. I like to compare the Destiny line to the Vibe line. You get a lot of striking and hitting power for a ball that is on the lower cost scale. This ball is perfect when I need to get deep and the Choice Pearl or Paradox V is just to much ball. I highly recommend this.